We were able to make it to Florida at the end of summer to see our friends and family. We had a fantastic two weeks! 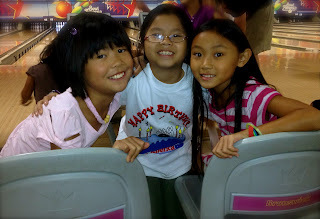 We celebrated my sister Hope's 10th birthday with a bowling party. This was Lily, Aaron & Joy's first time bowling. They all loved it. Unfortunately, all the pics of them actually bowling turned out blurry. We made it to Tampa to visit our friends over at Miracles and Blessings who just welcomed home their two newest daughters from China. When we first met our families only had 1 child living at home (their daughter, Tiff, in the striped shirt). Now together we have 10 children living at home! So fun! Such God moments we've all had together! And, it's always bitter sweet to see Dale's adult sons. We miss them so much. It's still hard to not be part of their daily lives. We were also able to spend at week at the beach (and see more friends there). But I am gonna have to save that post for another day.